If you want to see historic, REAL LIFE living, this is a must see! Alida Harper left her home to the Society of the Cincinnati in the State of Georgia to be used as state headquarters. She wanted future generations to see the lifestyle of the mid 1800’s. Her will stipulated that the house is to be properly maintained and can never be sold. Period pieces abound, and the Alida lovingly collected all of the furnishings, including her silver, china and crystal. The home features a traditional southern garden that you are welcome to roam and enjoy. Our tour guides are friendly, informed, and ready to greet you and make you feel at home. There are fascinating architectural details, artwork and interiors to see. 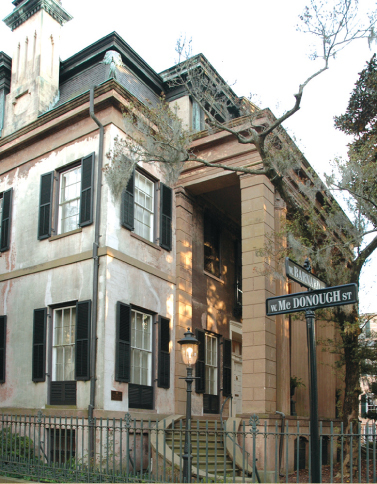 Learn about all the unique features and history of the Harper Fowlkes House by touring the home, located at 230 Barnard Street on Orleans Square in historic downtown Savannah, Georgia.